The Contour & Boost circuitry is of phase linear design, using high quality components. This ensures sonic clarity and midrange emphasis which is so important for electric guitar. The Contour & Boost is designed as a High Pass (low cut) and Low Pass (high cut) filter, with a fixed X-over frequency at 440Hz. The High Pass filter operates from 65Hz to 440Hz, and the Low Pass filter from 440Hz to 8kHz. Both filters are individually sweepable, with a boost range of up to 12dB. With these two filters it is possible to change the sound (contour) in any way your creativity allows you. 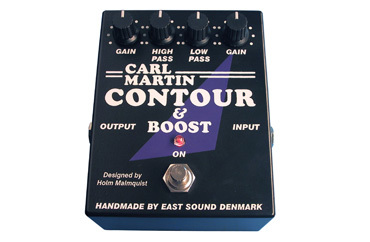 The Carl Martin Contour & Boost has a built in, regulated (+-12V) power supply which enables us to design circuitry of the highest quality with maximum headroom. Please note that when using this unit with other effect devices, always place the Contour & Boost after any distortion units, otherwise the distortion unit will limit what you can achieve with the Contour & Boost.